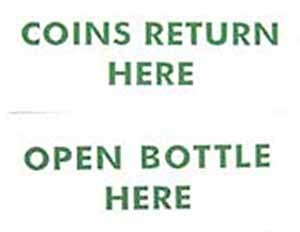 BOTTLE OPENER & COIN RETURN decals for large door coin machines and square top machines. Green for 7-Up machines, die cut decal! Such as the Vendo VF-56 VF-63 VF-77 VMC-56, VMC-77, VMC-126 and others.